While not the ideal battery pack for keeping phones powered while traveling, the DBPower Q100 Portable Energy Storage Battery has its place. 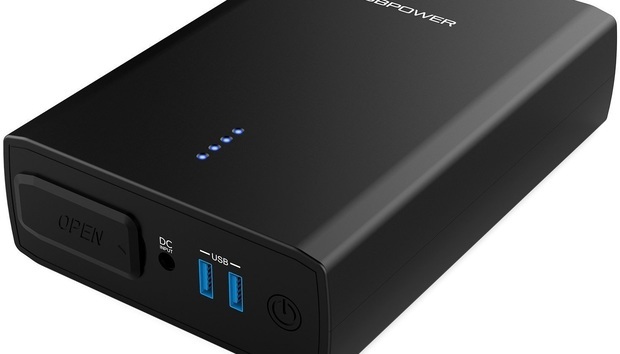 It’s packed with 26,400mAh (97.68Wh) of power. In total, it weighs just over two pounds, measuring 7.2 x 4.8 x 1.6 inches. It’s small enough to fit into a backpack, but big enough you likely won’t want to carry it around airports all day. On the front is a covered 110V outlet plug, and two USB-A ports. Sandwiched in-between is a DC input used to charge the Q100. A power button to the far right of the ports has four blue indicator lights on the top. The two USB ports are capable of charging a smartphone at 5V/2.2A, which we verified with our testing equipment. However, if you want to use fast charging with the Q100 you only need to plug your smartphone’s original charger into the AC port. When you remove the cover on the AC port, you’ll notice it has it’s own dedicated power switch. Plug your device into the AC port, slide the switch to the on position. It’s capable of charging a MacBook, or powering small household devices. On the downside, the Q100 performed lower than we had hoped when it came to efficiency, at 73.82 percent. Still, that’s not a horrible number, with the overall average for all battery packs we’ve tested being 83.35 percent. The Q100 relies on its own charging accessory to stay powered. It’s a bit of an inconvenience to have to worry about packing an extra charger when taking the pack with you, but the upside is how fast it charges the battery. At 14.5V/2.5A, the Q100 goes from empty to full in 3.5 hours. That’s incredibly fast for a battery of this size. Bottom line: Keeping a power bank like the Q100 around for power outages or when outdoors is a sound option.